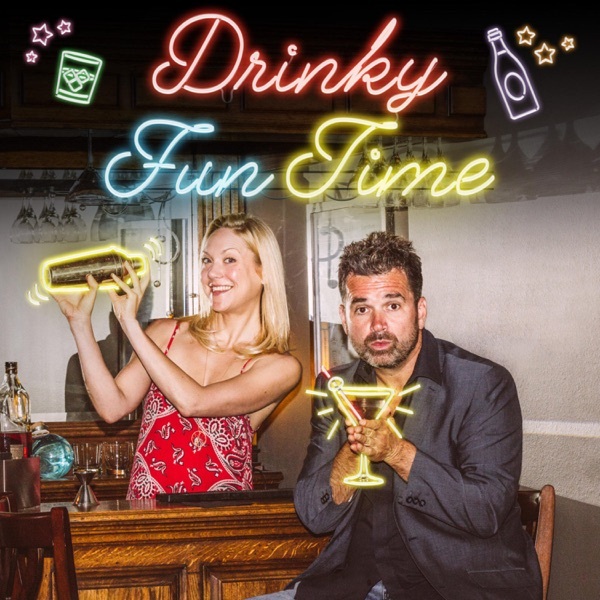 Drinky Fun Time | Listen Free on Castbox. Emma treats Dan to a 2000-year-old Christmas delicacy - mulled wine. Steamy eastern spices, sugar and The Federalist wine make for a toasty festive tipple worthy of any Holiday celebration. Dan also quizzes Emma on some choice British Christmas hits. Where do you stand on “Love Actually”? Tune in to cast your vote, and happy holidays to you and yours from the whole Drinky Fun Time crew! Dan treats Emma to a dose of American winemaking history while sampling delectable reds and whites from the Federalist - perfect for pairing with your Thanksgiving feast! Model, musician, motorhead, and all-around badass Levi Stocke slugs High West whiskey with Dan and Emma at the world famous Melrose Umbrella Company in Los Angeles. Celebrity Chefs Curtis Stone, Brendon Collins and Hugh Acheson sip wine with Dan and Emma at the L.A Food &amp; Wine festival and reflect and laugh about their early kitchen days under the likes of Marco Pierre White. "L.A Chefs toast Food & Wine"
“Somebody Feed Phil” star, Phil Rosenthal, and his Emmy award winning best pal, Tom Caltabiano, join Dan and Emma to delight in Hendricks gin cockails at L.A Food & Wine Festival at Santa Monica airport. We celebrate the Emmy Awards by sipping on the official sparkling wine of the event. Matteo Bruno Lunelli joins the show and teaches us all why his Ferrari sparkling wine is the Television Academy’s drink of choice - while Emma, Dan and Producer Beau all share tales from attending the big show. Three-time "Cake Wars" winners Kimberly Gafter and Jennifer Duncan host Dan and Emma at their San Diego bakery and show how the mastery of flour, sugar and butter can be the ultimate pairing to any adult beverage...except Fernet! Nathan “Nearest" Green was the slave who taught Jack Daniel to distill Tennessee whiskey, and now his name is on a bottle. Dan and Emma are joined by author Fawn Weaver, whose pursuit of the truth brought to light one of the most amazing stories in spirits history. Dan and Emma chat with L.A bartending legend Eric “ET” Tecosky about one of the most iconic American brands of all time, Jack Daniel’s Tennessee Whiskey, and Frank Sinatra - Jack’s greatest fan. Recorded at Seaworthy in the New Orleans' French Quarter. What do Dan and Emma have in common with Franklin D. Roosevelt, Dan Aykroyd and Clark Gable? They’ve all been on board the meticulously restored 1927 vintage rail car known as the Patrón Tequila Express. Dan and Emma, however, were surely the only ones in the group knocking back tequila-based Tiki drinks aboard the train at this year’s Tales of the Cocktail festival in New Orleans. But the ticket, take the ride!